A new study from user research platform UserTesting reveals that providing great customer experiences is becoming a greater focus for many businesses. The UX Industry Report, which surveyed 7,725 people, shows that user experience (UX) budgets are on the rise. In 2014, for example, the largest segment was the $1 to $500 monthly budget range, but in 2015 that number rose to the $1,001 to $5,000 monthly range. What’s more, there was a rise in the frequency of testing with the percentage of respondents who ran tests daily doubling from 2014 to 2015. And in 2016, 60 percent of respondents say their company will test more frequently. "For years we've been hearing that customer experience is a priority for executives, but for the first time this survey reveals that companies of all sizes are finally making significant investments in CX (customer experience)," said UserTesting President and COO, Chris Hicken. In addition to increased budgets and testing, the study found that UX research is expanding into marketing and product teams, with both of these teams weaving customer feedback into their processes more than ever before (see image). Lastly, the study is shedding light on trends impacting the UX. 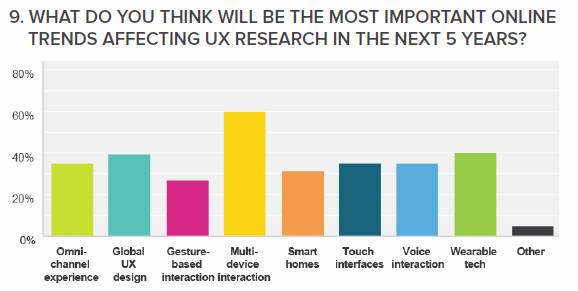 According to the data, 60 percent of respondents chose multi-device interaction as the most important online trend affecting UX research in the next 5 years. This makes multi-device interaction the leading trend impacting UX research for three years in a row. This data, however, is not that surprising as the line between digital and physical experiences continues to blur due to the popularity of mobile devices.